Compiling books on great Test match centuries always strikes me as a brave choice as everyone has a different view and opinion. 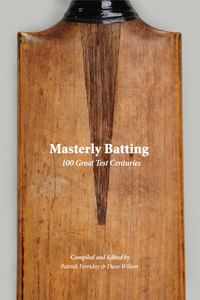 After the introduction, the book starts with a chapter called The Measuring Stick which gauges the impact of an innings and takes into account ten points which all contribute to the standing of the hundred innings listed. The points include batting conditions, strength of the bowling attack, impact on match and series, size of innings and dropped catches during the innings. From this criteria, it can be seen that great care and attention has been paid and undoubtedly adds weight to the innings chosen. The compilers/editors of Masterly Batting both sound interesting people. Both born in England, both moved overseas although Patrick is now back in sunny Sussex, Dave seems well-ensconced in even sunnier California. Both obviously have a love of cricket and write extremely well as do the other contributors to the hundred essays. I was struck me initially by the names given to the categories of the centuries: Foothills, Ascent and Pinnacle: surely the idea of someone interested in mountaineering and presumably Dave Wilson may be behind this as his biography states his first book being called Rock Formations. Maybe? Maybe not. In any event, the names of the categories adequately express what the reader can expect of the respective innings. The final countdown from 25 to the best innings in the book contains a scorecard of the match and statistically it is good as is the small but fascinating statistical summary which completes the book. I could mention some of the innings chosen but maybe it would be more interesting to pick the book up and enjoy some of the innings which we may have seen live, maybe on the television or maybe simply through media reports – and wish that we had been there. Another standout feature of the book is its high quality publication and, at £15, is very good value. Well-researched and informative, this is a most interesting book and very well worth buying.